With an ever increasing desire to utilize accelerated bridge construction (ABC) techniques, it is becoming critical that bridge designers and contractors have confidence in typical details. The Keg Creek Bridge on US 6 in Iowa was a recent ABC example that utilized a number of connection details that had been utilized elsewhere. The connection details used between the drilled shaft and pier column and between the pier column and the pier cap were details needing evaluation. These connection details utilized grouted couplers that have been tested by others with mixed results—some indicating quality performance and some indicating questionable performance. 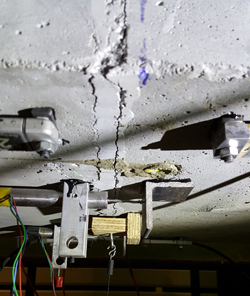 There was a need to test these couplers to gain an understanding of their performance in likely Iowa details and to understand how their performance might be impacted by different construction processes. 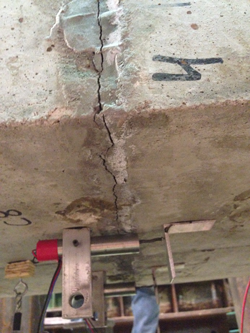 The objective of the work was to perform laboratory testing and evaluation of the grouted coupler connection details utilized on precast concrete elements for the Keg Creek Bridge. 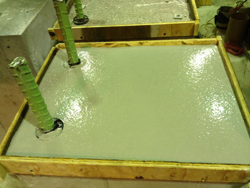 The Bridge Engineering Center (BEC), with the assistance of the Iowa Department of Transportation (DOT) Office of Bridges and Structures, developed specimens representative of the Keg Creek Bridge connections for testing under static and fatigue loads in the structures laboratory. The specimens were also evaluated for their ability to resist the intrusion of water and chlorides. Evaluation of their performance was made through comparisons with design assumptions and previous research, as well as the physical performance of the coupled connections.